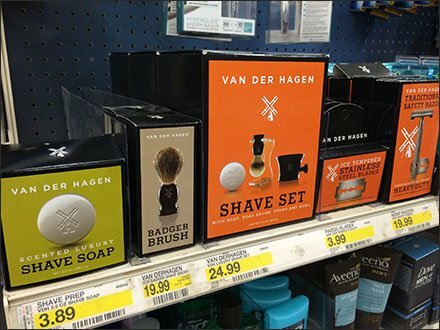 Van Der Haggen® creates an variety-based array of individually packaged shaving items to both dominate the shelf landscape and create visual interest. Different sizes, orientations, logograph proportions, and colors add to the appeal. If varying color, I might have interspaced differently for more contrast, but how to control position down to the final inch when the store creates the display? Take what you can that is good in this presentation, and there is much, and see if you can take to the next level for your goods or in-store retail presentation.